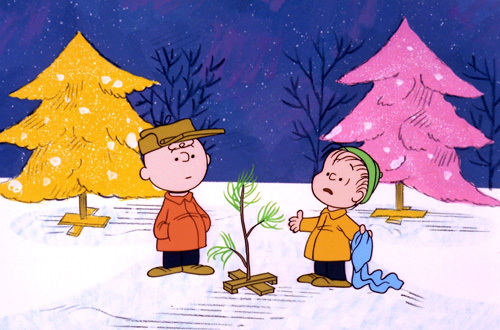 The classic 1965 special A Charlie Brown Christmas will be broadcast on ABC twice, first on Monday, December 5 from 8:00 - 8:30 PM, and again on Thursday, December 15 from 8:00 - 9:00 PM (all times Eastern/Pacific). It's important to note that the December 5th broadcast of A Charlie Brown Christmas will be edited to fit into a half-hour time slot; ABC is using it as a lead-in to their new Prep & Landing 2 special, which is airing in the following half-hour. If you want to see the unedited version of the Peanuts special, you should wait to tune in until the December 15 broadcast, when A Charlie Brown Christmas has a full hour time slot and will run unedited together with a Prep & Landing short and Charlie Brown's Christmas Tales. And in addition to the original Christmas special, the 2003 special I Want a Dog for Christmas, Charlie Brown will also be airing twice on ABC in December. The first broadcast will be Monday, December 12 from 8:00 - 9:00 PM, and the second on Thursday, December 22 from 9:00 - 10:00 PM (all times Eastern/Pacific).